Baker Perkins was at ProSweets 2015 in Cologne, Hall 10.1, stand D043 to discuss our latest cooking and depositing systems for the confectionery industry, plus extrusion and co-extrusion lines for snacks. The growing market for high-value functional and medicated confectionery presents an opportunity for confectioners as well as manufacturers of healthcare products. The high quality, accurate dosing and hygienic manufacturing offered by depositing make it the ideal process for this market. Functional, and especially medicated, confectionery are not new, but modern cooking and depositing techniques have broadened the range of potential applications. The smooth mouth-feel and continuous release of deposited hard candy is ideal for medicated products, while jelly and fruit products are more suited to functional applications. The consistent high quality of both product types supports high pricing and healthcare positioning. The functional sector ranges from boosting the intake of essential nutrients such as vitamins, minerals, fibre and protein to adding beneficial supplements such as folic acid and Omega-3 to the diet. This sector also extends to sports nutrition where deposited candy is ideally suited to portable and convenient energy and recovery products. Medicated products include ingredients such as antiseptics, menthol and eucalyptus oil to alleviate the symptoms of minor ailments such as coughs, colds, sore throats and nasal congestion. The depositing process adheres to the principles of GMP and is readily capable of validation to FDA/EMEA standards. Our development programme expanding the range of the lollipop sector takes another step forward with one-shot technology for depositing double-ball lollipops. This latest innovation further extends the product growth potential and consumer appeal of lollipops. 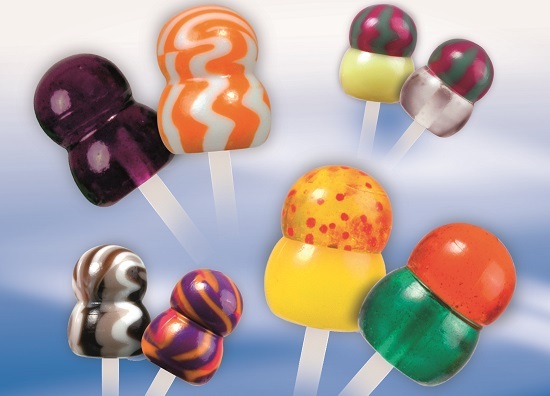 Ball and flat lollipops, plus shaped, 3D and embossed versions of the flat product are already being made on Baker Perkins ServoForm™ lines. 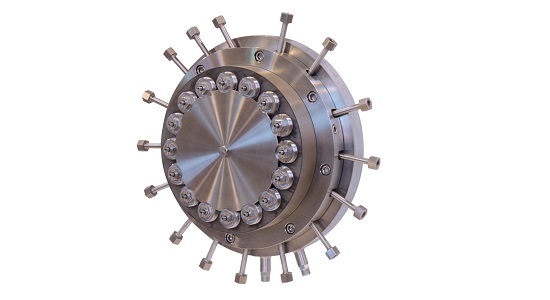 Existing lollipop depositing systems can be simply and cost-effectively adapted to produce double-ball products by fitting a new set of moulds. The range of product options is wide-ranging. One to four colours, centre-fillings, stripes, layers, inclusions, sugar-free and sugar options are all available to bring eye-catching interest. Double-ball lollipops were developed in Baker Perkins’ Innovation Centre at Peterborough. The Centre is fundamental to our strategy of supporting customers from initial concept development to maximising performance of installed plant. Here, development and pilot scale equipment is available to enable you to create new products and processes, produce samples for evaluation, conduct feasibility trials and train staff. Baker Perkins is acknowledged by confectionery companies around the world as the leader in cooking and starchless depositing systems. Our lines make hard candy, lollipops, toffees, caramels, fudge, fondant, and jellies. Depositing is the process of choice for confectioners developing original, high-quality candies. It offers greater quality and production flexibility, with lower production costs, than conventional methods such as die forming, starch mogul or cut-and-wrap. Baker Perkins’ one-shot ServoForm™ depositing systems combine up to four components into a single candy with centre-fillings, multi-colours, stripes, layers, inclusions. Sugar-free and sugar options bring variety and eye-catching appeal. Our new 16-stream die increases the output capability of Baker Perkins’ co-extrusion systems for snacks. The die is a key part of CoEx Master™ Systems combining two components - a cereal outer and a centre filling. Fillings can be of virtually any colour or flavour – sweet and savoury creams, fruit pastes, chocolate praline and cheese are typical, and innovative snacks can be developed using different flavours in the filling and coating. As well as familiar flavours, Asian, Middle Eastern and Hispanic tastes are increasingly popular. Chilli, paprika, teriyaki, guacamole, sweet and sour, black bean sauce and a wide family of curries can be used individually or in combination to produce snacks with high consumer appeal.